A gamer by vocation and an office dweller by dint of circumstance, Sorin lives in the beautiful city of Vancouver with his wonderful wife and their vicious parrot. Born in Romania, Sorin stubbornly resisted the temptation to learn English for well over twenty years. When he finally gave in, it was not work or video games that weakened his resolve, but rather the mindboggling discovery of Terry Pratchett, Douglas Adams and Monty Python. It is probably no wonder that Sorin learned to be funny before being fluent (even if he does say so himself). Find out more about Sorin at www.sorinsuciu.com. Laura is an Australian who keeps forgetting she's meant to stay in the same place. She loves adventures--which is good, because she's constantly winding up in the middle of them. When she's not accidentally finding herself in the middle of a riot, being tear-gassed or jumping into frozen rivers, she enjoys sailing, snowboarding, and making an obnoxious number of puns. You can follow Laura and her latest adventures at www.explaura.net, or check her out on Goodreads (www.goodreads.com/thelauramay). Anna Mattaar has written stories ever since she knows how words work. She went to art school, where she studied something complicated about games and theatre. This helped her look at storytelling from several interesting new angles, but somehow she keeps returning to the written word. She lives in a small town in the Netherlands and is currently writing for a computer game and trying to finish the first draft of her debut fantasy novel. Caroline Friedel is a scientist by heart and by training. She obtained a B.Sc. and M.Sc. degree in bioinformatics from a joint programme of the two major Munich Universities, and a Ph.D. from the Ludwig-Maximilians-University (LMU) Munich. Following appointments as assistant professor first at Heidelberg University and later in Munich, she is now an associate professor at the LMU Munich. To date, she has published over 40 scientific articles and book chapters, but this is her first work of fiction. Working on the short story was quite an enjoyable diversion, even though the review process for the anthology did trigger a few unpleasant flashbacks to scientific review processes. At least this time, it was allowed to actually make up the response to the reviewers. Caroline can now be found scribbling away at a few other short stories in between doing serious science and trying to write grant applications. Charlotte absolutely adores Terry Pratchett, and Mort is one of her favourite characters. She has always been interested in reading and is usually to be found halfway through a book, whether it's The Hunger Games or Tess of the D'Urbervilles. Writing is a passion of Charlotte's, and she hopes to pursue a creative writing course at university in a few years' time. Choong Jay Vee writes because life isn't stressful enough. She has contributed short stories to Esquire Malaysia and KL Noir Yellow, a local crime fiction anthology. DK Mok is a fantasy and science fiction author whose novels include Hunt for Valamon and The Other Tree, published by Spence City. DK's work has been shortlisted for an Aurealis Award and a Washington Science Fiction Association Small Press Award. DK graduated from UNSW with a degree in Psychology, pursuing her interest in both social justice and scientist humour. DK lives in Sydney, Australia, and her favourite fossil deposit is the Burgess Shale. Find out more at www.dkmok.com. With a wife and three daughters, Luke lives in constant fear for his life. He knows that there is a god, and that this deity pays him special attention – because his first full time job was working at a supermarket in Kent, and after moving halfway across the country his next full time job was (and is) working in a factory exclusively serving said supermarket. He has co-owned and written for videogames blog www.criticalgamer.co.uk since 2009, and boy are his fingers sore. When he grows up, he wants to be Batman. Lyn Godfrey is a small-town, southwestern, animal-loving kind of girl. She is a self-described Geek of All Trades. Videos games, sci-fi, steampunk, zombies, and so on and so forth. If it's nerdy, she loves it. Yes, that includes Star Wars AND Star Trek. Michael is a software developer from Germany who has a fondness for books that has gotten slightly out of hand. He spends a lot of his free time with writing stories, adding books to the ever-growing piles next to the sofa, and gradually converting his living room into a workshop for doing traditional bookbinding. This is his first time being published. Mike Reeves-McMillan has a black belt, which holds up his trousers. He's not sure why authors make such a big deal of these, but they are certainly convenient, trouserwise. For someone with an English degree, he's spent a surprising amount of time wearing a hard hat. He's also studied ritualmaking, hypnotherapy and health science. He writes strange worlds that people want to live in, notably the Gryphon Clerks series of novels. He himself lives in Auckland, New Zealand, and also in his head, where the weather is more reliable and there are a lot more dragons. Peter Knighton lives in the north of England and this is his first attempt at writing fiction. He works for the government producing statistical reports, which contrary to popular belief aren't classed as fiction. Phil was born and raised in London, and currently lives with his partner in Buckinghamshire. He has been a coffee-maker, a hotel housekeeper and a military archivist before training at the Royal Academy of Dramatic Art (Class of 2013) and has worked in theatre and on screen before and since. He is constantly plagued by the sound of his dogs sneaking up on him. Robert loves to tell stories, but it wasn't until he went away to university that he really started to write any of them down. Since then, he's created comedy sketches and stand-up sets, written some highly opinionated critiques of films and games, and currently enjoys a small amount of success as a freelancer producing show reviews for the York Press, as well as a few humorous web articles. 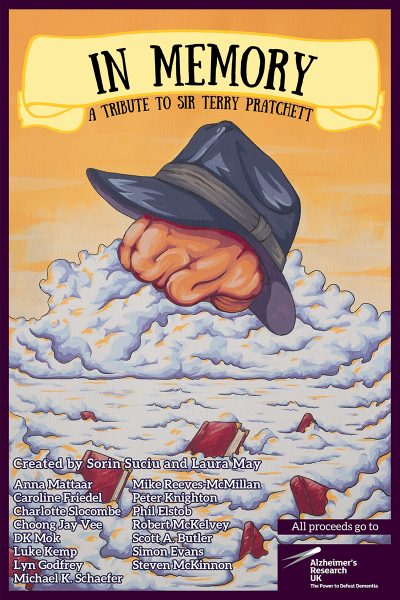 He was inspired from an early age by authors like the late, great Sir Terry Pratchett. Scott A. Butler is a British gentleman who resides in the county of Essex in England. After losing his natural hearing at a very young age, Scott developed a very active imagination. He discovered his passion for writing when he found an antique typewriter in his grandparent's house as a child. When Scott doesn't have Cavalier King Charles Spaniels climbing all over him, he can be found working on one of his many book projects, almost always with a cup of tea at hand. He enjoys the challenge of writing in multiple genres. Simon Evans is a Londoner who lives in Wiltshire, whence he retired after working in California for many years. He has written extensively. A book of WW2 letters, edited by him, has recently been published. His short stories have been read on local radio, and he has contributed to various radio and stage dramas. He is currently finishing a humorous book on the attempts of a small southeastern country to build a railway. Simon has also written science fiction stories and is half way through a novel about Mars, seen from an unusual perspective. Steven is an independent writer living, eating and just about breathing in Glasgow. He is the author of Boldly Going Nowhere, in which he tells the story of how he broke free from the suffocating rut he was in. When not writing deeply personal stories about his private life and showing them to the world, Steven will either be eating cake, listening to Iron Maiden, or filling his brain with pointless Buffy and Battlestar Galactica trivia. He completed two courses of Creative Writing at the University of Glasgow in 2010, and completed an HNC in Professional Writing Skills at Reid Kerr College in 2006. He is 29, and was born in the bathroom of a high-rise flat in Glasgow on the 18th of March 1986. See a full list here. "Like a fantasy cousin to Xanth" - Piers Anthony. | What happens when you take a heartless prince, a talking horse, a brain-washed princess, and a bunch of fish, and stick them all together in a world of puns? Ridiculousness, that's what. Will the prince manage to rescue the princess? Will he break free from his curse? And most importantly, will there be a happily ever after? 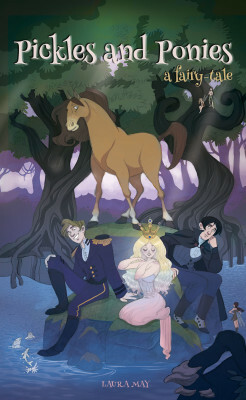 Pickles and Ponies is an adult fairy-tale (but not that kind of 'adult') for the jaded and the young-at-heart alike.